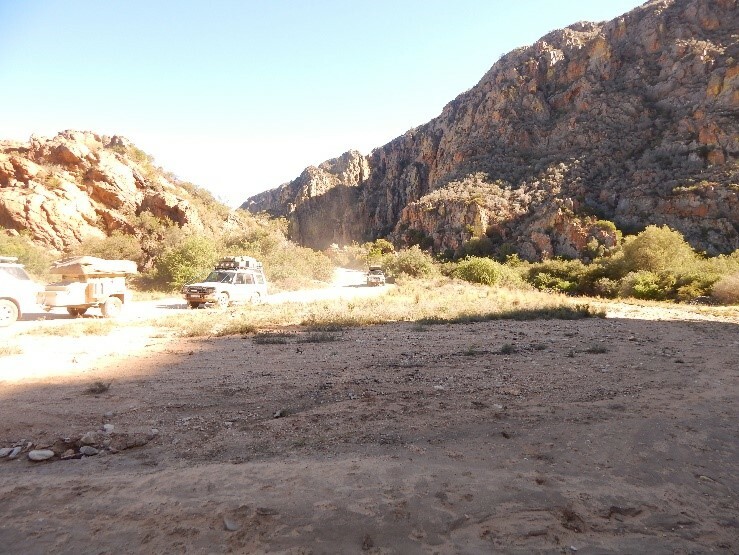 The Baviaanskloof is a really special place, it’s not your normal 4x4 trip which takes you into the wilds over rough and rugged terrain to remote campsites that have wild animals wondering through them 24 hours a day. No the Baviaanskloof is a place of extreme natural beauty and spectacular land formations in an area of around 400 000 HA. 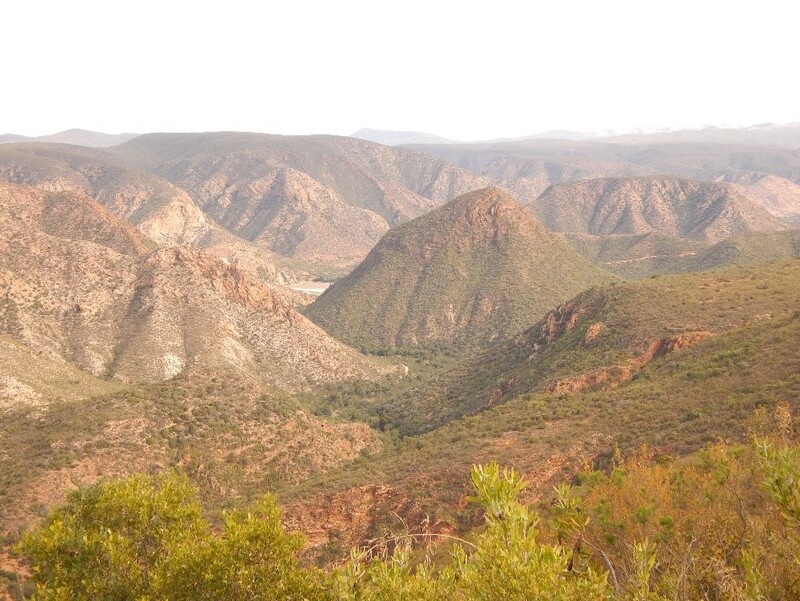 The Baviaanskloof, or “Valley of the Baboons” lies between the east-west running Baviaanskloof and the Kouga mountain ranges in the western region of the Eastern Cape. 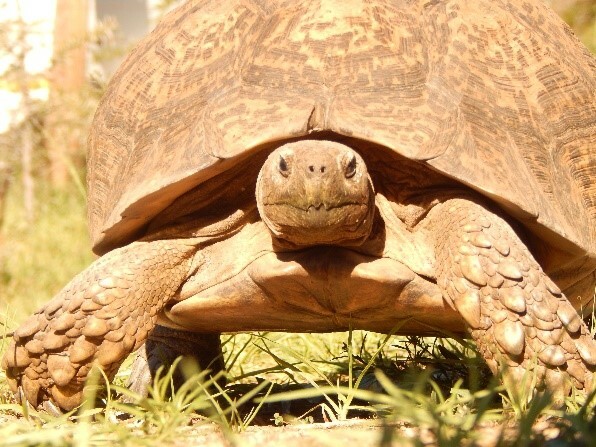 The Baviaanskloof with its spectacular land forms is clad in a diverse array of plants and inhabited by a large variety of animals, all of which keeps one constantly entertained wherever you go and whichever way you look. Our group, made up of 12 adults in 5 4x4’s all met at a place called “Die Gwharries” guest house a few kilometers from Patensie, here we got to know each other around a braai and a few beers on the first night. DAY 1 The following morning we were on our way by 08h30 to Bhejane game reserve for two nights. The route which we were to follow on our way was an interesting one. We were going to drive the Antoniesberg Berg pass. 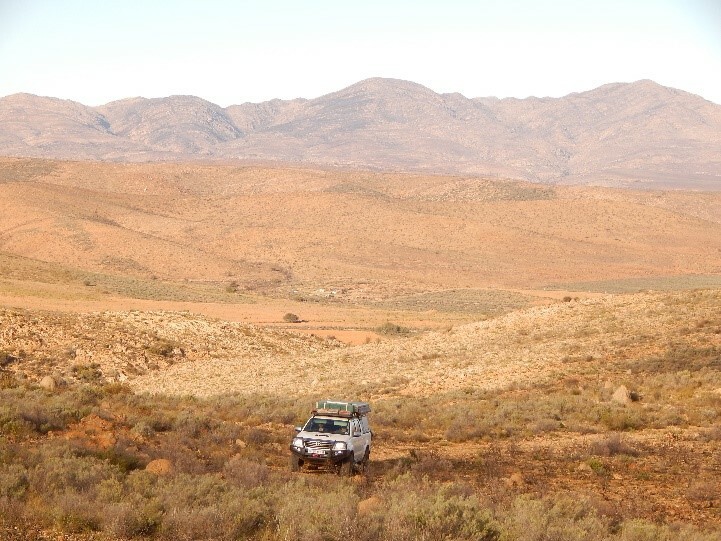 The pass is a rough, steep gravel pass which crosses the Grootrivier on the northern side of the Baviaanskloof Mountains. The pass itself is not very long, but the access roads is what makes this drive something of an adventure and is only passable in a 4 wheel drive with high ground clearance. 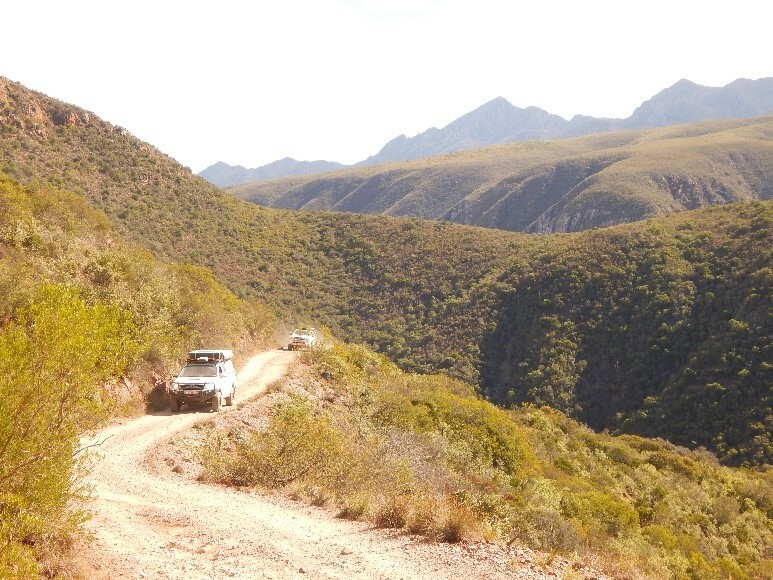 The pass offers an interesting 4x4 drive with stunning scenery of the Gamtoos Valley to the south and the canyon which has been formed by the Groot River over many years. We had our break at Grootrivier Poort which is where the route crosses the Groot River. Our next stop was at Steytlerville. Steytlerville is the centre of the wool and mohair district of the south eastern corner of the Great Karoo and is known for its astonishing variety of semi –desert vegetation which includes dwarf Shrubs, tiny succulents, umbrella shaped wild Plumb trees and ancient Cycads. Steytlerville is a clean and tidy town with friendly folk and we spent a while there having a bite to eat and a fine mug of Cappuccino. From here we had a 50 kilometer drive to Bhejane. The route which we took was through the valley which offered fantastic scenery and a few well-kept old farm houses with their zinc roofs and large farm style verandahs along the way. That night we had a big fire going in the boma at our camp site in Bhejane. The temperatures in this area of the Karoo had us all with our winter woolies on and all the bedding that we had brought with us ready for the night. The night time temperatures were very low and in the morning it was around 3deg c.
Day 2 We spent the next day in the Bhejane game reserve taking in what activities we could. The owners, Adriana and Philip of Bhejane are typical “Country Folk”, very friendly and going out of their way to make sure that our stay with them would be a memorable one. We took a short hike around the reserve after breakfast, followed this up at the coffee shop next to the reception and then at 4.30, we were collected in a game drive vehicle and together with one of ours we went off to feed the Buffalo. The big bull was aptly named Maximum and he certainly was a large bull with wide horns. Maximum let us know who was in charge here and kept a constant eye on his latest calf, Minimum. From here we were off to feed the Lechwe, on the far side of the reserve. Lechwe are predominantly swamp animals found in the delta area of Botswana but they are now being successfully bred in the Eastern Cape and in the Karoo of all places. The best was saved till last, in the next enclosure we fed a small herd of Sable antelope. What an absolute pleasure with these majestic animals been up so close and not too worried with our presence. In the background but not been fed was a herd of Eland. The Karoo is a sparsely vegetated area and the reason for feeding the breeding herds is serve as a supplement to their daily diet and they are fed every single day. Another fine braai fire to warm us up before the cold night ahead of us. Around the camp site we spotted Bush Buck, Mongoose, Serval and Genet, we were advised to watch out for the monkeys and baboon as they can be a problem, but they gave us a wide berth and we never saw any sign of them. Bhejane is a really pleasant stop over point with friendly owners at affordable prices and if you are in the area, I would recommend it. In addition to the camp site they also have a few chalets with fine views of the reserve. Day 3 We had a 90km drive to Vaalwater Lodge, not far from Willowmore. Willowmore is another clean and tidy town with plenty of interesting shops, curious, ATMs and eating places. We had lunch at the hotel and is so common in the Karoo towns, everyone is just so friendly and accommodating. Once again the drive was never a dull one, the country side was great and driving into the camp site just seemed to come along all too soon. The caretakers at Vaalwater have been hand rearing blue cranes for a number of years now and whilst we were there they had “Gogga” a six month old crane that was now been fed only once a day, the rest of the time it finds its own. Within a few more months the feeding will stop altogether and the bird will fend for itself. The reason for the rearing of the birds is due to the high mortality rate of the new born chicks by small predators such as jackal and caracal. Then there are also the feathered predator’s that feed on the chicks. Vaalwater has the most amazing ablution facilities of all the places we stayed at. They are large, very clean and well-kept with hot and cold water. The campsite is big and plenty of space for all, needless to say we had our usual fires going, some braaing and some cooking on gas. Day 4 Before we headed off down into the Kloof proper today, we took a quick 4x4 drive around the hills on the Northern section of the farm where we got to do a bit of game viewing along the way. The 4x4 trail took us about an hour or so but it was a pleasant drive where we got to use low ratio on a few occasions whilst driving up the steeper rocky climbs and then down again on the other side. According to the GPS we only had 50 kilometers to go to the campsite at Bo-Kloof, we would be descending into the main Kloof of Baviaans so there would be lots to see and photograph as we made our way through. 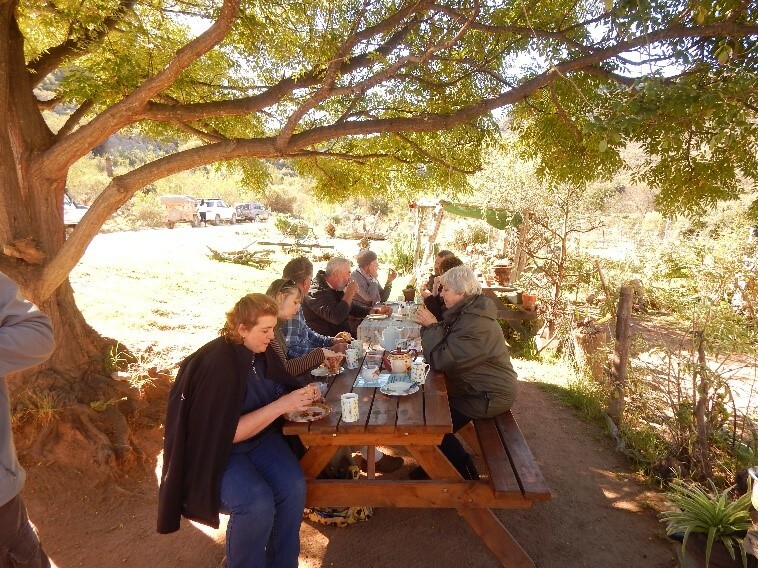 We arrived at the Baviaanskloof Curio shop by around lunch time and everyone ordered the coffee shop’s Rooster Brood and Honey with cheese or mince or whatever they had going on the day. Together with a cup of coffee it all went down very well, and sitting on the side of the main road under the trees made for an enjoyable hour or so. On the way to BO Kloof, we were lucky to spot their elusive Anotolian Shepard dogs in one of the sheep enclosures on the side of the road. They are big dogs and their role in life is to live with the sheep and protect the flock from any harm, such as predators. The digs are big with white bodies and black heads, the same as the sheep and together with their long hair, blend in very well with their flock. The dogs originate if turkey where they are actually a protected species. The local baboon troop welcomed us to the campsite from up in the hills behind us, juts letting us know that they are there and to look after our goods at all times. Needless to say during our two day stay at Bo Kloof neither the monkeys nor the baboons came into camp. Day 5 After breakfast we stopped off at the reception where, between us, we virtually wiped out the farm’s supply of honey in one go. Bo Kloof are well known for their fresh honey which they produce on the farm, farm fresh I guess. From stocking up on Honey for a long time to come, we went out to meet with Patrick at Sewe Fontein and the wild Fig Forest. First we went with Patrick to Sewe Fontein where he told us everything about the spring. Sewe Fontein is actually spring number seven, and at the same time the biggest flowing spring. The crystal clear cool spring water just bubbles out from the ground as it has been doing since 1937. The water is used for drinking and irrigation purposes by the locals in their everyday lives. I forget all the figures that Patrick gave us, but it must have a constant flow rate of at least 5 litres per second, possibly more. The wild fig forest is quite spectacular by the sheer size of the trees and how the fallen ones seem to survive once they have toppled over. Apparently the big fig trees do not have very deep rooting system due to the shallow underground rock surfaces, and they may topple in the big storms that do occur in the Kloof from time to time. From there it was off to see the Makadat Caves, a place of accommodation where the guests stay in open caves in the side of the mountains overlooking the Kloof. The one we visited was only assessable by 4 wheel drive and was situated pretty high up in the mountains and was a ten sleeper. It’s certainly not 5 star accommodation but for a night or two sleeping in a cave in Baviaanskloof, I thinks it’s really great, has hot and cold water with flushing toilets, soft beds with matteresses and a Kitchen sink with stove. Day 5 Today we would pass through the Baviaanskloof nature reserve and then out past Patensie and on to Inni Kloof just outside Hankey. The nature reserve is around 70 kilometers in length and is only accessible by 4 wheel drive. 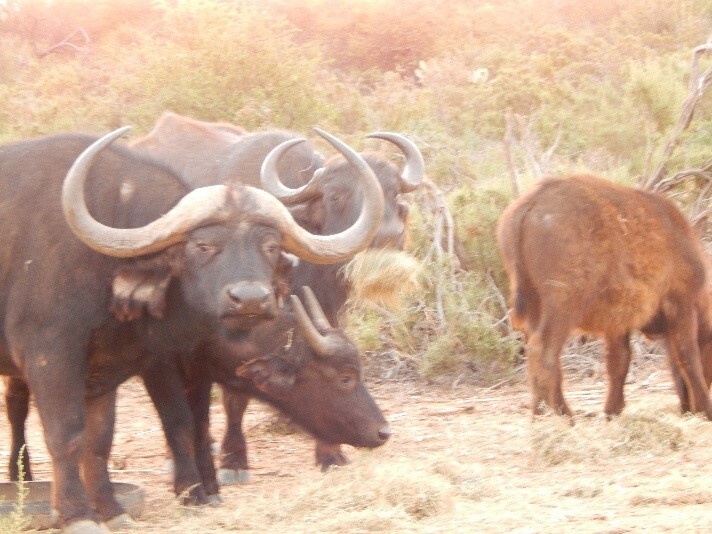 The reserve section has a herd of buffalo ranging in around 250 head strong and for that reason, we were only allowed to get out of our vehicles at the designated picnic spots. This was not really a problem for us and we were also lucky enough to spot one loan buffalo very close to the side of the road. The bush was fairly thick at that point and I have no doubt that there must have been other close by. Over and above the buffalo, we saw quite a few buck in the bushes, especially in the wetter parts where the road ran alongside the river. The drive through the reserve section is absolutely stunning, mountain passes, their shapes and sizes and all covered in an assortment of vegetation makes it an absolute paradise and a place that should be on everyone’s bucket list. The going was slow, but then the passes are single vehicle width and often quite rough with very high and steep drop offs on the side. When you come up against an on- coming vehicle, size counts. The bigger you convoy the more chance you have of making the other party revers or in the case of towing the other party reverses. What happens if both parties are towing? I really don’t know. We encountered two different vehicles, one it was a reserve ranger who reversed his vehicle for us and the second was two ladies, neither of who felt comfortable reversing on the pass. Needless to say I reversed their vehicle for them whilst they got a lift in mine. The camp site at Inni Kloof was really great, a large camp site with a big communal fire pit and reasonable ablutions. Two of our party want an early departure for home the next morning and to up- grade to the nearby chalets. Owners John and Catherina came down to the fire and chatted for a while and it was good to hear how life carries on in the Baviaanskloof and the problems that the farmers have and don’t have. The trip went off without any problem and was enjoyed by all and a general comment from everyone was, why we have waited so long before visiting the Baviaanskloof. It was enjoyed by all and with a really great group of people who all help make the trip what it is.